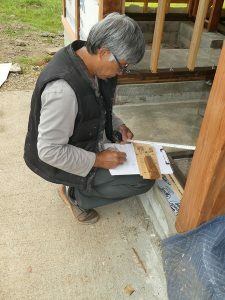 On completing the work of adding exterior base coat stucco, Sakaguchi-san measured the dimensions of door and window framing. 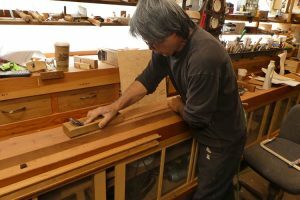 He then returned to his shop to fabricate the doors and windows. 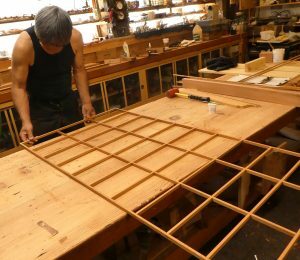 During this time, he also constructed framing components for the tatami floor and various cabinetry. 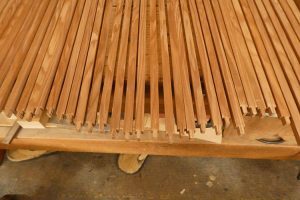 He selected the lumber pieces which consisted of redwood, mahogany and rosewood, then measured and did the rough cutting of components. 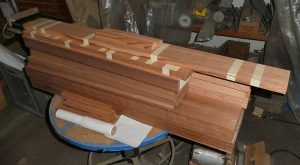 He squared them by putting them through the joiner and planer. 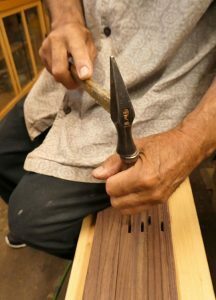 He had to let them sit for some days in his shop to see if they twisted at all. 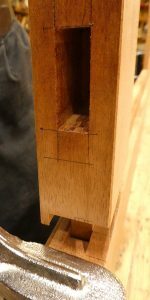 The ones that did, he put through the joiner and planer again. 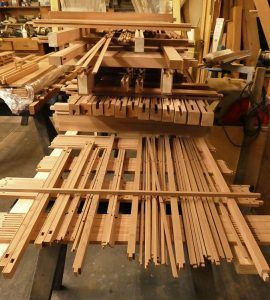 For some components, he had to repeat this a third time before doing layout for the joinery. 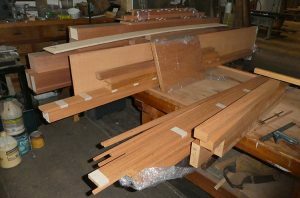 Rough cut door and window components. 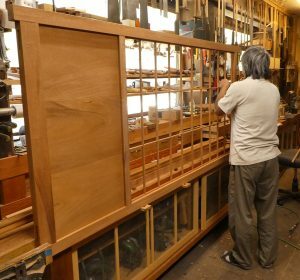 After Sakaguchi-san finished the layout, he cut out the joinery and did the finish planing on the components, mainly by hand. 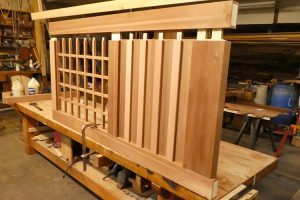 Door and window components with cutout joinery. 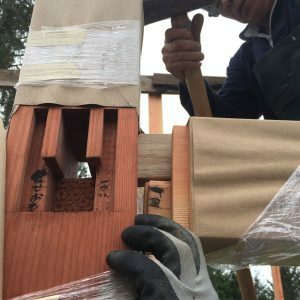 He then assembled the doors and windows. 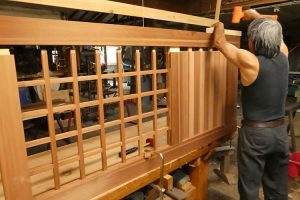 Shoji door with wood panels. 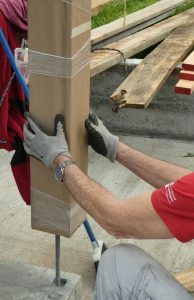 Detail hand- cut design in door component. 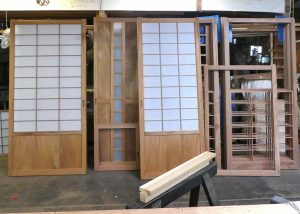 Shoji doors, some completed with shoji paper. 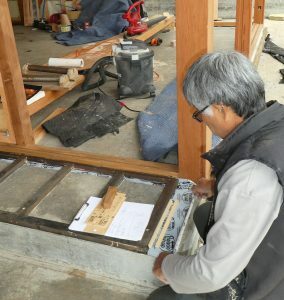 Door for ofuroba (bathing room with wooden soaking tub). 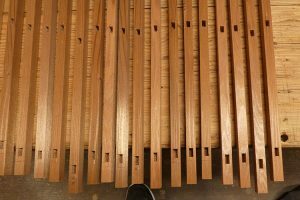 Detail hand-cut wooden handle for sliding glass and shoji doors. 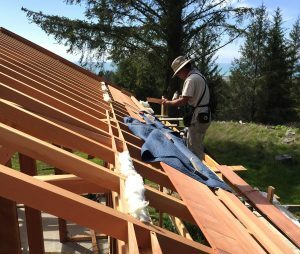 The roof was shingled by a talented local roofer to save on cost and time. 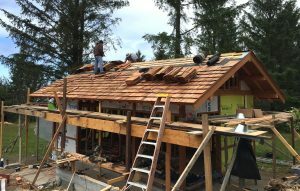 Western-style wooden (Western red cedar) shingles are thicker and larger than Japanese-style cedar shingles, so the look is not as subtle as a traditional Japanese shingled roof. 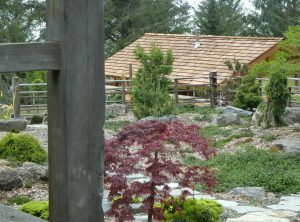 View of roof from garden. 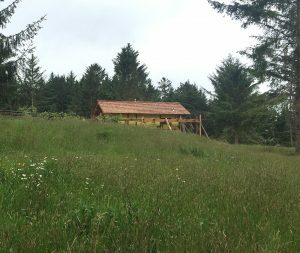 View of roof from meadow. 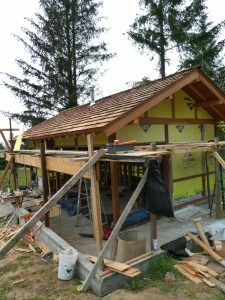 After the shingling, exterior wall sheathing was added. 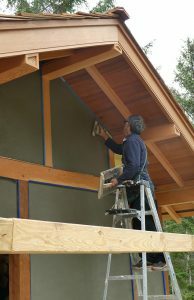 Then Sakaguchi-san troweled a basecoat plaster over the sheathing. 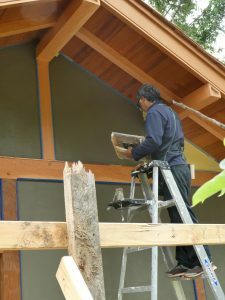 When this was completed, he returned to his shop to cut out redwood siding for the lower portion of the exterior wall. 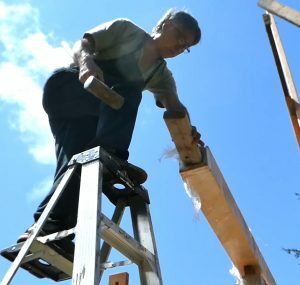 The owners attached the siding themselves. 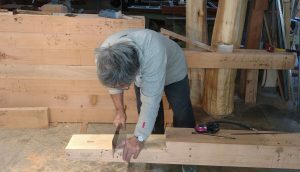 Sakaguchi-san cutting out post and beam joinery in his shop. 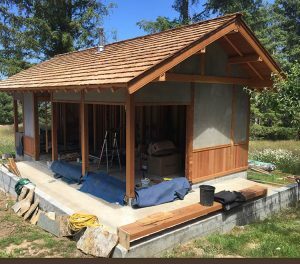 Hiroshi Sakaguchi is in process of constructing a building which will include a furoba (traditional Japanese bathing room with a Japanese wooden soaking tub), a small dressing room and half bathroom, a sauna, and a 6-mat tatami room to be used as a guest room or tea room. 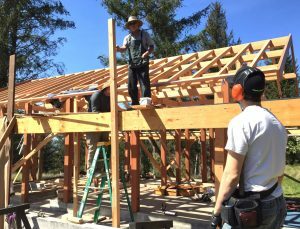 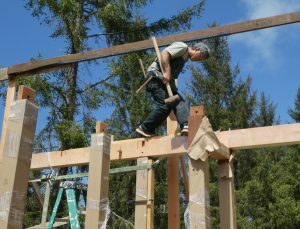 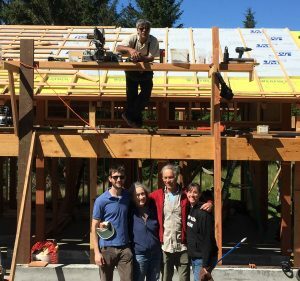 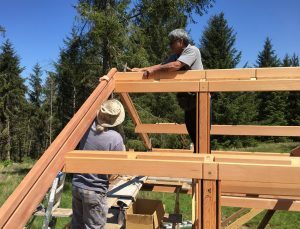 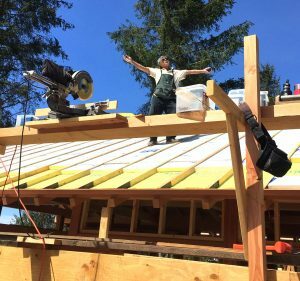 The building, 16’ by 26’, is being fabricated using traditional Japanese wooden post and beam construction. 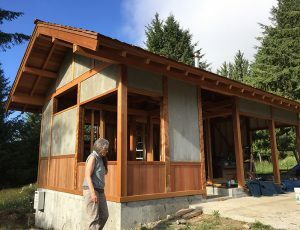 The basic floor plan was designed by the owners, then modified by Sakaguchi-san to fit the requirements of Japanese construction. 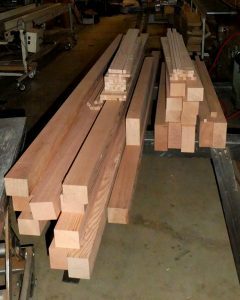 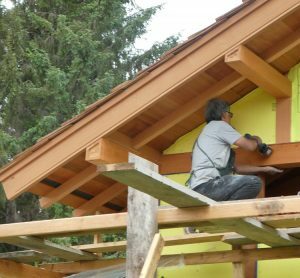 Very high quality clear, tight vertical grain redwood and doug fir were procured by the owners– redwood for the main posts and doug fir for the beams. 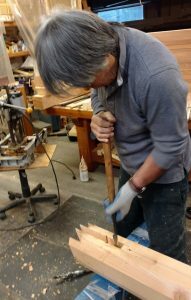 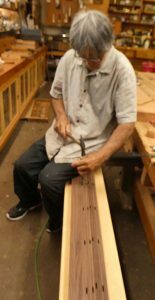 Sakaguchi-san shaped and hand-planed the wooden components and hand-cut the joinery in his workshop from late summer 2017 to early winter 2018. 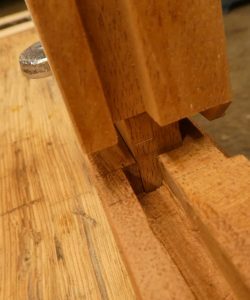 Cutting joinery. 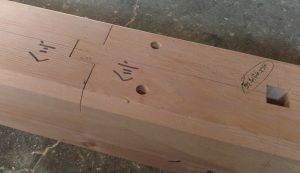 Note layout markings done with sumi ink. 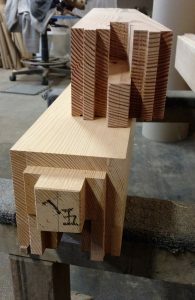 Joinery connecting 2 boards to create long beam. 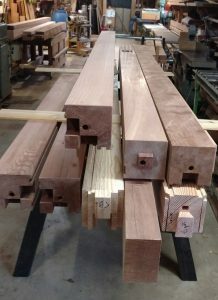 In late March 2018, the components were transported to the building site on the coast in Northern California. 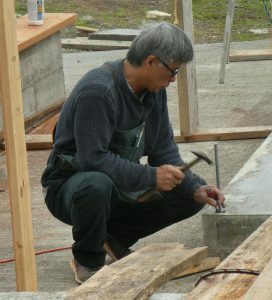 In late April (waiting for good weather), Sakaguchi-san drove to the site to assemble the building. 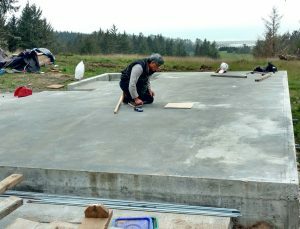 The structure’s foundation is a concrete slab, and his first step was to layout the floor plan on the slab’s surface. 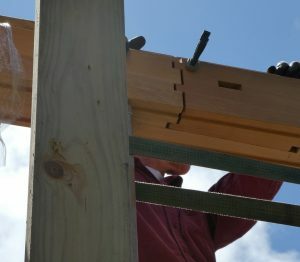 He then secured bolts in the slab and structural framing was assembled. 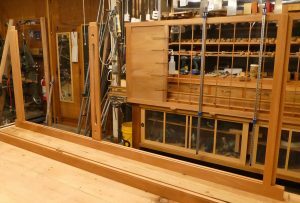 He was aided in the assembly by the owners, their son and daughter, and friends. 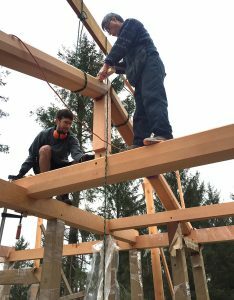 The heavy structural beams were lifted up with an electric hoist. 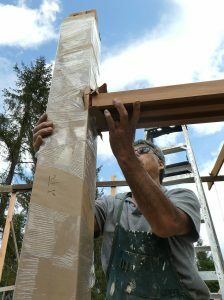 Temporary scaffolding was built to enable this process. 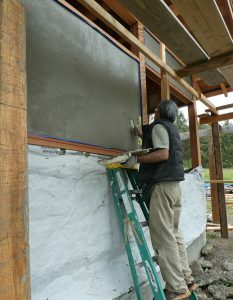 Beginning layout on foundation surface. 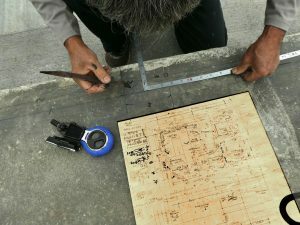 Laying out floor plan on slab from drawing on plywood. 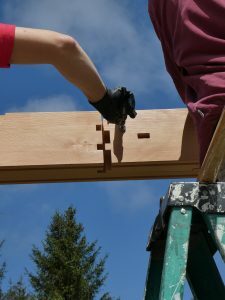 Fitting framing beam into post. 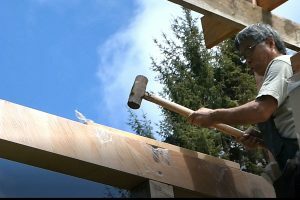 Pounding end of long beam to tighten connection. 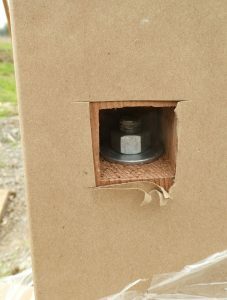 Connection has tightened and process continues until fit is perfect. 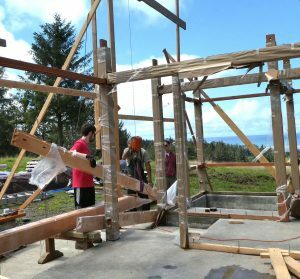 After assembling wall post and beam structure, the scaffolding was removed and new scaffolding put up for installing the roof structure. 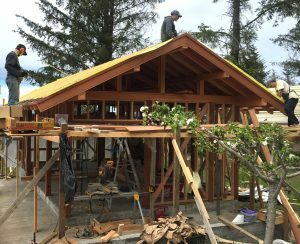 Roof structural components were then put in place. 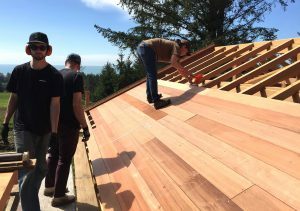 After assembling roof structure, redwood ceiling boards were attached. 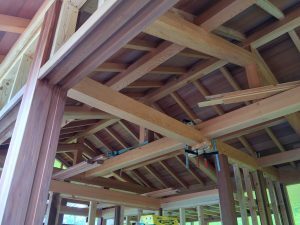 The building will have an open ceiling exposing structural framing. 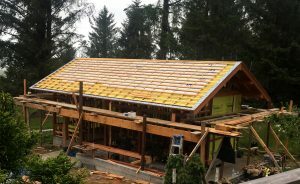 Next roof insulation was added to be followed by exterior framing to support cedar shingles.